Thirty-year-old Tishun Butler performed a series of false shuffles at the St. Petersberg Derby Lane Racino by which his yet unidentified cohort walked away from the poker game with thirty grand in profit. According to reports, surveillance at the casino/greyhound track had quality videotape of Butler false-shuffling the cards on several occasions. The winning player also was an ex-poker dealer at the casino. He has not yet been charged with a crime but probably will be soon. This is not the first smudge on poker-play in the Tampa/St. Petersberg area. 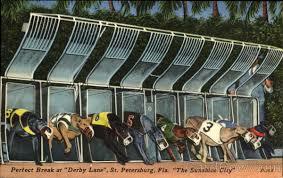 Twenty miles from the Derby Lane Casino is the Silks poker room at Tampa Bay Downs where several cheating incidents and good old-fashioned ripoffs occurred in poker tournaments. In December, 2016 the Pompano Beach Poker Tour collapsed in disgraced after it was revealed that several winning players from its Aruba main event who were due more than $300,000 had never been paid, including the tournament winner Stephen Deutsch who was supposed to receive more than $133,000. As well, Tampa Bay Downs is involved in a lawsuit in which a Ponzi scheme bilked several poker players out of large sums of money. And if that were not enough, pro poker player Mark Klang accused fellow South Florida pros Justin Zaki, Paul Dlugozima, Fillip Khavin and WSOP bracelet-winner John Racener of not paying nearly $500,000 in debts tied to games they played at the Derby Lane. My take: Well, it seems to me like Tampa is to crooked poker what Steubenville, Ohio was once to crooked casinos! Back on October 16, I wrote an article about what I thought was Stephen Paddock´s motive for mass-murdering 58 innocent people and wounding hundreds more in Las Vegas on October 1st. As deranged as he had to be to commit such a heinous act, the reason appeared quite obvious to me once it was reported that Paddock had no terrorism connection and had left no communication explaining his act. And what really made the case for me was that he had been losing heavily playing Las Vegas video poker machines. He was also losing some of his high-living comps at the casinos, which must have aggravated him greatly. So I wrote that his motive had to be an attack on the Las Vegas establishment itself, not on the people who were killed and injured. In other words, Paddock was pissed off about losing his money and decided to make Las Vegas pay for it. Those of you who read my post may have been surprised by my summation but recently this article appeared in the Las Vegas Review Journal. It supports my theory, and unless or until some other viable theory comes to light, it is a fact that Stephen Paddock murdered and wounded all those people simply because he was enraged about his massive gambling losses.